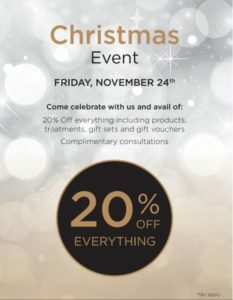 There is 20% off selected treatments and gift sets this Friday at Therapie Opera Lane including Image laser treatments. Anti-ageing injectibles are now 3 for 2 and there are great offers to be had on Lip Fillers too. Christmas appointments are filling up fast. Book now for pre-Christmas appointments.